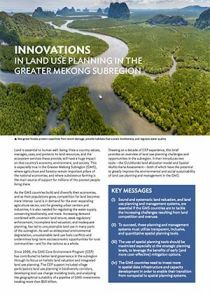 This brief provides an overview of land use planning challenges and opportunities in the Greater Mekong Subregion and introduces tools to improve land use planning and management in the subregion. The Greater Mekong Subregion’s (GMS) Core Environment Program (CEP) has contributed to better land governance in the subregion since 2006 through its focus on holistic land valuation and integrated land use planning. The CEP support included village participatory land use planning in biodiversity corridors, developing land use change modeling tools, and analyzing the geographical suitability of a pipeline of GMS investments totaling more than $50 billion. Drawing on a decade of CEP experience, this brief provides an overview of land use planning challenges and opportunities in the subregion. It then introduces two tools—the CLUMondo land allocation model and Spatial Multicriteria Assessment—both of which have the potential to greatly improve the environmental and social sustainability of land use planning and management in the GMS. Sound and systematic land valuation, and land use planning and management systems, are essential if the GMS countries are to tackle the increasing challenges resulting from land competition and overuse. To succeed, these planning and management systems must utilize transparent, inclusive, and quantitative spatial planning tools. The use of spatial planning tools should be maximized especially at the strategic planning levels, to leverage the benefits of early (and more cost-effective) mitigation options. The GMS countries need to invest more in spatial data infrastructure and capacity development in order to enable their transition from nonspatial to spatial planning systems.